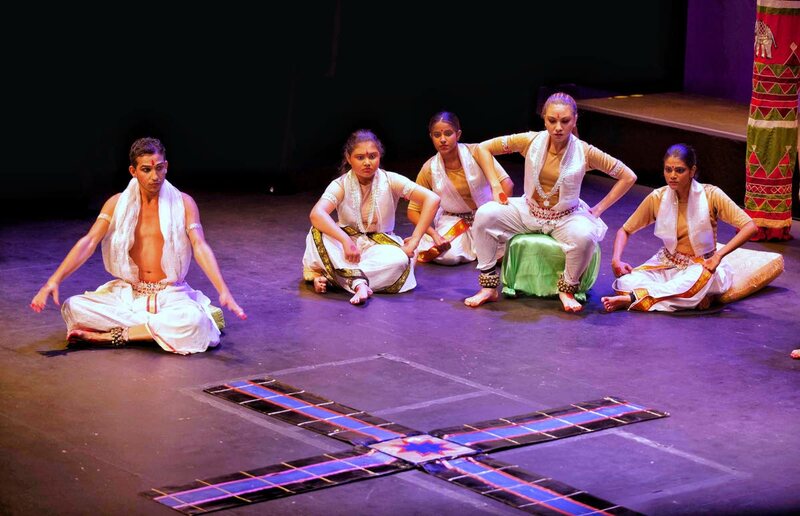 Students of the Nrityanjali Dance Theatre in The Divine Flute 2015. The Nrityanjali Dance Theatre is one of the pioneering schools of Indian dance in Trinidad. Founded in 1977 by Sat Balkaransingh and Mondira Balkaransingh, it was incorporated as a non-profit organisation in 1994. Since its creation, the theatre’s main objective has been to promote, develop and maintain public education in and appreciation of Indian Classical dance, drama, song and music in all its aspects. Forty years later, Nrityanjali is still true to its original vision — teaching classical dance based on a prescribed syllabus, inviting and presenting international artistes and staging annual ballets/dance dramas.Today the theatre is famous mainly for its Odissi dance performances and ballets, and has presented over 40 stage productions, dance performances and dance dramas over the years in Trinidad and the wider Caribbean, South America, the US, the UK and India. Over the years, The Nrityanjali Theatre has made a name for itself mainly because of the high standards it sets for its classes and performances, and its extensive use of original choreography in full-length ballets. Its consistent commitment to excellence has been formally recognised over the years by numerous accolades and awards, such as award of National Cultural Icons to Sat Balkaransingh and Mondira Balkaransingh (1992); the Humming Bird Medal (Gold) for Culture (1993); the Coco Vanguard Award (2015) and the award for Outstanding Contribution to the Preservation and Promotion of Indian Culture in TT and other Caribbean Countries (2016). The 40th Anniversary celebrations begin with a Dinner and Fashion Show tomorrow, at El Dorado Secondary West, El Dorado. The ballet that follows later in the year will honour the theatre’s rich heritage with selected items from past performances and will be held at two venues: at the National Academy for the Performing Arts in San Fernando on September 17 and at Queen’s Hall on November 4 and 5. For more information see Facebook at Nrityanjali Theatre, Trinidad. Reply to "Celebrating 40 years of dance"